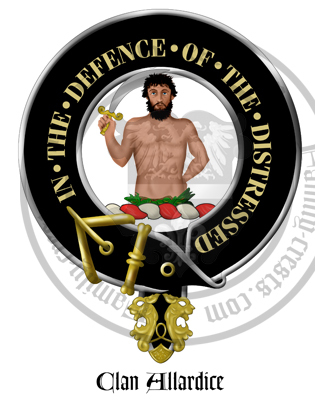 Clan Badge: A naked man from the middle holding in the dexter hand a scimetar all proper. Motto: In the defence of the distressed. Arms: Argent, a fesse wavy gules, between three boars’ heads erased sable. Crest: A naked man from the middle holding in the dexter hand a scimetar all proper.